John Madden saunters into a small dining establishment just outside Dallas, TX after another 5 grueling hours in the broadcast booth calling another Cowboys game. Football commentary is hard work, and heaven knows a man builds up an appetite. And Madden is in the right place, for Sunday is all-you-can-eat BBQ beef rib day at the Choke'N'Slurp and Madden's been holding off on the snacks. Jose Cuervo, the curator of the Choke'N'Slurp, greets Madden as he walks in the door. Cuervo's uneasiness that he will lose lots of money when Madden orders all-you-can-eat is overcome by the increased publicity and stature he brings to his restaurant. "Senor Madden! You want the ribs, right." "Yes, Senor Cuervo. And keep 'em coming! You know that no one can eat more BBQ beef ribs than me!" "Maybe nobody's ever tried before!" A hush falls over the restaurant as the patrons look to see Willian "The Refrigerator" Perry, recently retired from the Eagles, standing in the doorway. The Fridge's large door-filling girth and his special monogramed Wet-Nap (tm) packets tell Madden that this is no amateur. He sits across from Madden and says "Bring me one more rib than him." And thus it begins. Motivation is high, for these two have had a long standing feud (I won't go into it, but it all began with one of those Thanksgiving Day 6-legged turkeys). For extra motivation: winner gets free desert. Who do you like, Steve, in this Greasy Gridiron Grudge Match? STEVE: These two walking stomachs both have their work cut out for them. However, I have to go with Fridge on this one, because he has the mental edge. Let me explain. Fridge is fresh enough out of the game that he still retains his NFL-honed concentration. He will be able to focus on his rib-gnawing to the extent of all else. However, anyone who has seen John Madden in the past few years knows that his attention span is only slightly longer than that of a two year old child. Distractions, distractions, distractions. The moment his attention is away from eating ribs, he will lose precious ground. Of course, Fridge will take advantage of this. He just has to say: "Look at that tethered blimp -- it's tethered!" or "Check out how big that guy's head is!" or "John, tell me about ACE hardware." Madden will be so busy staring and talking that he will be unable to keep up with Fridge. Fridge by 52 ribs. BRIAN: Here we go again with your oversimplistic, shortsighted analyses again. I was hoping this Super Bowl page would provide you with inspiration to give better insight than you usually do, but, alas, no. Even if The Fridge were to distract Madden briefly with false promises of tethered blimps, Madden's veteran skills will allow him to catch up easily. Of course, this is moot because this will never happen. Sure, Madden is easily distracted during a game, but what else does he have to do besides diagram a coaches hairline? Try to follow the 35-3 Cowboys lead? Talk to Pat Summerall? Yawn!! But now he is in his true element. And while cloud formations may be of more interest than a McDonald's (tm) Game Break (tm), they hardly compare to Cuervo's classic BBQ beef ribs. Once Madden sees those ribs, you will see a concentration not unlike that of a diamond cutter. And, as I alluded to before, Madden has experience. Perry's recent retirement makes him a rookie in the fat slob business. True, he has always been big, but it's a whole different world in retirement. Perry will be outgluttoned and outclassed on this day, although he will learn much from The Master, and will, one day, overtake him. STEVE: First of all, we've been through this whole Master/Apprentice thing once before. As I seem to remember, you sided with the apprentice (Vader) last time, as opposed to the master (Obi-Wan). Nice flip-flop, Mr. Politician. I see you only pick "the master" when it's convenient. Listen, Madden's old beaten stomach just doesn't have the resiliency it once did. Imagine old, dried, cracked, brittle rubber. That's what his stomach looks like. On the other hand, Fridge's stomach is still in it's prime. Imagine those little balloons surgeons use to open up clogged arteries (of which there will be a shortage after this match). Super flexible. That's what Fridge's stomach is made from. And his stomach has plenty of room to stretch and expand. They don't call him Fridge for nothing! BRIAN: Sigh. Hello, Steve! There's a forest here! Can't you see the forest? Ignore all the trees and try to see the forest! Why did I pick Vader? Not because he was the apprentice, but because his powers had surpassed that of his master (let's face, Vader was an apprentice LONG, LONG AGO (tm)). If you had read, you would have realized that I acknowledged the fact that The Fridge will one day surpass the Madden in greatness - but not yet. He has much to learn. It is only through the Madden's goodness that he will not destroy The Fridge in his naive, vulnerable state. He will wish later that he had, but I digress. The one thing that age teaches us is that life is not one dimensional. John Madden has evidently learned this lesson and it has affected his eating prowess. Let's face it, there was a time in Maddens eating career when he would have taken the "Fridge", hands down. But alas, that day has passed. Madden has mellowed into a gastronomic shadow of his former self. Eating is no longer his life, his focus, his "cause celebre." After all, he has dropped a few pounds in the last number of years. The Fridge, on the other hand, has grown larger than Puerto Rico. Eating is his life. Eating was more important than football, more important than breathing itself. At least Madden still sees the need to hold down a job. And apart from the occasional grease stain on his shirt noticed during an ACE Hardware commercial, the casual observer wouldn't even know he was a former professional eater. With this in mind I believe that Perry could out eat Madden then turn right around and eat Madden himself and still have room for Jello. This is not mere speculation, this conclusion is based on a solid piece of evidence...that famous John Madden six-legged turkey. The fact is Madden actually GIVES IT AWAY!!! It's food... and a lot of it, and he gives it away! I mean, can you imagine in your wildest dreams, the "Fridge" giving away one Ho-Ho much less an entire turkey; with six drumsticks no less! No way! You'd need a tranquilizer gun to get that bird away from him. I'm a real Madden fan, but this one's no contest. It's the "Fridge." And if, heaven forbid, there was an accidental sloshing of BBQ sauce upon an exposed portion of flesh during the eating frenzy, Madden may well run the risk of losing an arm or leg. I had to pick The Fridge over Madden for one simple reason...revenge. Perry played for the Eagles for a while, and thus into him was placed a hatred of the Oakland Raiders who defeated the Eagles in Philly's only Superbowl appearance. Madden used to coach the Raiders, so any Eagle obviously has added incentive to win this matchup. As sure as the Eagles fans booed Santa, the Fridge will win this one by a half a pig. I can see it now. The Fridge will generously hand big John a pen and point out that if ever there was a whiteboard, this tablecloth is it. By the time Madden's finished drawing, the Fridge will have a huge lead and will know Madden's strategy into the bargain! I voted for the Fridge because I KNOW for a FACT that he removed his front teeth to allow for more aerodynamic food intake. Madden, on the other hand, had his fixed for TV. So Fridge wins by two sleek and speedy ribs. First of all, we'll need some room around the contestants as their rapid-growing gravity wells attract new natural satellites in the forms of unlucky waiters, flatware, Buicks, etc. Once the necessary precautions are taken, the victor is obvious: The Fridge. Why, you ask? Simple-- Madden's attention span might be elongated by the presence of food, but not enough to defend against the placemat. That's right, every time he looks down at the plate he sees those puzzles n' games for the kiddies on the placemat. It's only a matter of time before his announcer instincts kick in and he's drawing in Ronald the Clown's game plan for getting to the center of the maze where the hamburger is. God help him if there's a tic-tac-toe board on it; you'll never get him out of the restaurant. While he's giving commentary on how the dot-to-dot portrait is coming together, the Fridge is eating Europe's share of next year's food supply. I always knew those placemats would amount to no good. Gotta go with Big John Madden. I've learned from recently declassified FAA documents that the real reason the Big John doesn't fly isn't because he's scared of planes (or that Amtrak is paying him big bucks). It's because they won't let him on any US airline due to security regulations. John lost his original stomach in an all-you-can-eat Norwegian food buffet accident as a teenager. His artificial steel lined stomach is a sure fail at any airports metal detector. That same steel lined stomach is going to assure his victory in this contest of ribs. John can even eat the bones thanks to the extra $250 he spent for the grinding & chopping option. The Fridge loses out to the Disposal in short order. Well, Fridge has the edge in this one thanks to his actual experience in playing football for a Super Bowl team. All Madden's experience stems from Thanksgiving day games involving one of two blue and silver teams, both of which tend to make one feel sick if followed too much. Fridge has actually played and (b)eaten both teams, giving him an extra edge in the turkey department. Madden viciously digs into his first rib, stuffing it into his mouth and chewing vigorously. Fridge frantically tears at the meat, consuming mass quantities that could put that Tyrannosaurus from Jurrasic park to shame. The intake of food is so great, a vortex is formed, sucking in all the side dishes and beverages in the bar, and nearly compromising several toupees. Eventually, Madden's flaw ends up being his analysing mind. After a particularly stylish consumption of a rib, he turns to his telestrator to outline his feat on instant replay. Fridge takes this time to swallow five ribs and three tall glasses of beer, the last of which spills on Madden's shirt. The referee jumps in, whistle frantically blowing, calling a personal foul and assessing a 15 pints of barbecue sauce penalty. However, in the process, he mentions that Al Davis is once again moving to L.A., and Madden loses his appetite for the rest of the evening. C'mon! We're talking the FRIDGE here! He ate whole offensive lines for lunch! Now, if this were a talking contest, John Madden would have it in the bag. He never shuts up. No matter how much you might want him to. But this will be a hindering factor. While John Madden talks and eats, the Fridge just eats and eats. Munch munch munch, no end in sight. 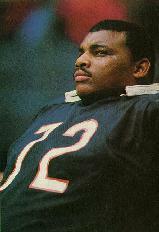 Plus, the Fridge played for Chicago--DA BEARS!. This means he played for Ditka. And, as we all know, Ditka could take God. So, due to the influence of Ditka, the Fridge also has another divine influence on his side. Da Fridge by 349 plates. People who think that John Madden can out eat the Fridge ignore one important fact: the superior conditioning of modern athletes. Just look at the distinguished eating carreers of these two men. The Fridge at times during his carreer with the Chicago Bears played at well over 350 pounds and even reached 380 pounds at one point. And that was when he had to be in shape! John Madden on the other hand didn't begin to *really* put on weight until he retired to the broadcast booth. Now that the Fridge has been freed from the constraints of athletic training he is free to balloon up to unprecedented proportions. This is even the legendary Madden will be no match for the mighty Fridge! The Fridge will obviously win this one. Madden is old and out of shape, the Fridge is young and out of shape, but the Fridge gets more exercise, burns more calories, and eats more food. This one is easy- the Fridge by 50+ ribs. Gentlemen, gentlemen, gentlemen! It is easily apparent that although Senor Madden will do his share to thin down the herd, a new King of da' Ribs will be crowned! I do like the elasticity theory, however, it goes beyond that. The intense competitive pressure will eventually do in "Bam Boom" (tm) Madden. After all, he got out of football because the pressure was causing him to have ulcers the size of Nebraska. Why did the Fridge get out? He was putting on more and more weight. How? By secretly training for this match for the past year by sneaking in the back door of the C and C and doing 50 rib wind sprints. The fridge will have 10 put away before Madden's denture cream is set. Final count : Madden 256, Fridge 377 plus two orders of curly fries. Gentlemen, your analysis ignores a crucial factor, this is a marathon not a sprint. In terms of pure stomach size and youth you have to go with Perry, but that is not the key. Madden will get so wound up telling stories and jumping around yelling and screaming that he will actually burn up more calories and ribs during the contest than the frig eating machine. Second, as time drags on each contestant has to focus on how they will get their incredible bulk home. Here Madden dominates, after all he rides around in a *bus*. Whatever Perry has it cannot possibly have the carrying capacity of a bus. (Unless he had the foresight to rent a flat-bed, which I doubt.) So you see, Madden has the total psychological advantage in the end game. I have to go with the Fridge for two reasons. First, mental health. The Fridge may or may not be a mental giant, but at least he doesn't have a mental health clinic named after him! Madden does. (Its at the Loyola Medical Center in Maywood, a suburb of Chicago) The second reason is sheer size. The Fridge is huge! Madden is just large. Being a fat slob myself, I feel that I can speak with some authority. Sure the Firdge has natural talent, but what counts in this game is experience. The stomach is like a balloon or a rubber band. The more you stretch it, the easier it becomes to stretch. Madden has been packing it away for many more years than Perry. Perry's stomach is tight (relatively speaking) and cannot take much pressure before bursting. The whole concentration thing is way off base. This is not a test of men, but a test of stomachs. When a bona-fina food hog steps to the buffet, it's all instinct baby! The stomach has a mind of it's own. It takes over, regardless of what the smaller mind inside your head may be thinking. So, I vote for Madden, but of course neither of these two could hold a candle to the true masters, Norm Peterson and Homer Simpson! I can't believe you both missed the obvious answer. Madden is older. Now let us assume that both could eat the ribs indefinitely. This is quite obviously the case. Therefore Madden is much closer to death than the good `ol fridge. Also you guys are forgetting. Madden is already a pig-out artist, this gives him some advantage. However, he has been pigging out on ribs for the past how many years? How much room can he have left? Now the fridge, on the other hand, Is just out of a football program. To play on a team, even the Eagles, you have to be in shape, er well a little bit, and so, He hasn't been eating so many ribs. This makes the Fridge Hungry. With a capital H.
I voted for Perry, just because he does indeed have the larger stomach, and if there's one thing I've learned about sports, it's don't bet on the white guy. It will not even be close but the Fridge will win. Already known for his ability to pack it away, hence the nickname The Fridge, he will be so intent on winning that he will crunch down the bones too. Madden will be so intimidated by this amazing act of jaw power that he will start to cry and wet his pants, therefore withdrawing from embarrassment.